In this week's College Football Corner: WTOP's Dave Preston lays out the reasons to love the Pac-12. WASHINGTON — There are many reasons to be infatuated with the Pac-12 Conference. First, it’s a league whose name actually reflects its membership number. Second, there’s never a shortage of exciting offensive players — even second-tier teams like Arizona and Oregon State boast the likes of J.J. Taylor and Jermar Jefferson (Taylor leads Jefferson by four yards in the race for leading rusher). And for some reason these schools simply put on more competitive shows than any other conference. The weekend began with USC salvaging its season by rallying past Washington State 39-36 and Saturday night ended with Washington holding off a late Arizona State rally in a 27-20 victory. 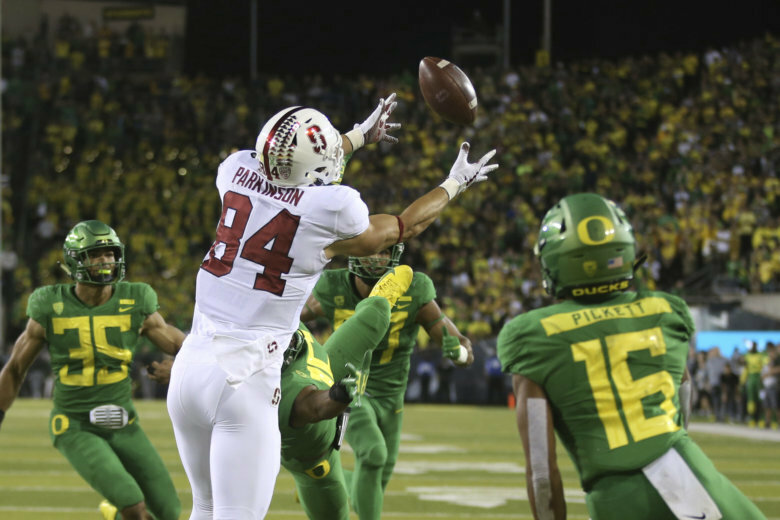 But the signature game of the week saw Stanford come back from 17 points down in the second half to outlast Oregon 38-31. The Cardinals have already beaten a pair of ranked foes and visit Notre Dame next Saturday. Here’s hoping they represent well in South Bend. Maryland (3-1, 1-0 Big Ten) not only bounced back from their loss to Temple but also won their Big Ten opener and enter the bye week in a good mood. The 42-13 smackdown of previously unbeaten Minnesota saw the Terps put together a highlight reel, tallying touchdowns of 21, 26, 36, 54, 64 and 81 yards. Terrapin Triumphs: Anthony McFarland and Ty Johnson both ran for over 100 yards, as the team gained 315 yards on ground. The defense held the Golden Gophers to 5-16 on third down and turned them over three times in the second half. Tre Watson notched nine tackles while returning an interception for a touchdown to start the second half. Terrapin Troubles: Ten penalties for 118 yards. Minnesota’s lone touchdown drive was aided by consecutive flags at midfield. The offense took a while to get going, converting 1-6 third downs in the first half while going three and out four times. Next: Oct. 6 at 3-1 Michigan. Virginia (3-1, 1-0 ACC) won its conference opener for the third straight year under coach Bronco Mendenhall. The 27-3 thumping of Louisville not only gets this team halfway to bowl eligibility, and in a year when the rest of the Coastal Division is somewhat suspect UVA may be rethinking its ceiling this fall. Cavalier Congrats: Bryce Perkins threw for two touchdowns and ran for a third while the offense converted 9-of-16 third downs. Charles Snowden led the defense with eight tackles, a sack, a fumble recovery and an interception. Cavalier Concerns: A.J. Mejia missed a 32-yard field goal attempt, his third miss from closer than 35 yards this spring. He was replaced by freshman Hunter Pearson. Next: Saturday at 3-0 NC State. Navy (2-2, 1-1 AAC) lost to previously winless SMU 31-30 in overtime. A less than ideal way to wrap up September, with the meat of their conference schedule plus games with the service academies and Notre Dame coming up. Midshipman Medals: 349 yards rushing plus 36:43 time of possession. Taylor Heflin tallied 12 tackles plus a sack and a forced fumble. Jarid Ryan notched at defensive PAT Conversion to jump-start a second-half rally. Midshipman Miscues: Three fumbles — two of which led to both of SMU’s offensive touchdowns in regulation (the third led to a missed field goal attempt). Special teams allowed a 98-yard kickoff return for a score. Next: Oct. 6 at 1-2 Air Force. Virginia Tech (2-1, 1-0 ACC) scheduled its game at Old Dominion to reward its fans in the “757” … unfortunately the Monarchs had other plans. The 49-35 loss to a previously winless team takes quite a bit of air out of what was looking like another great season in Blacksburg. Hokie Highlights: Steven Peoples rushes for 156 yards and two touchdowns while VT gains 318 yards on the ground. Damon Hazelton stretches the secondary with five catches for 154 yards and a score. Hokie Humblings: The same defense that kept Florida State out of the end zone allowed 632 yards to ODU — who scored touchdowns the last four times they had the ball. The offense converted just 4-of-14 third downs. Penalties were a problem, with seven flags for 95 yards. Next: Saturday at 4-0 Duke.